When it comes to the good ol U.S. of A., there’s a lot to love: Hotdogs. Fireworks. Fast food restaurants that stay open all night and let you buy a burger for a dollar. Free refills. Reality television. Real football. Deep fried food. The list is endless. It’s no wonder that you’re a true red-white-and-blue patriot. And we’re talking a real patriot, not like those guys who just like partying it up on the Fourth of July. You celebrate your country every other day of the year, too—especially on days like President’s Day (the third Monday of February,of course) and Election Day. Your ringtone is “The Star Spangled Banner.” Your entire house is decorated in red-white-and-blue color schemes. You drive a Jeep Patriot, and there’s no question what football team you cheer for. Well, worry no longer! 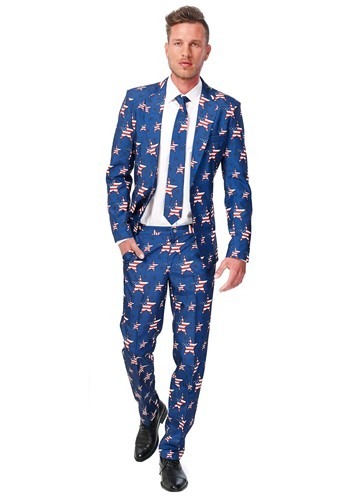 Now you can put your patriotism on full display thanks to this Men’s SuitMeister Basic Stars and Stripes Suit. This 100 percent polyester suit includes a navy blazer and trousers, both covered in stars featuring American flag print. The jacket comes with a two-button closure on front and false pocket flaps, while the pants have elastic bands on the sides for a perfectly comfy fit. There’s also a matching necktie, but we’ve got to warn you, it’s not a clip-on. It’s old-school, just like your sensibilities. 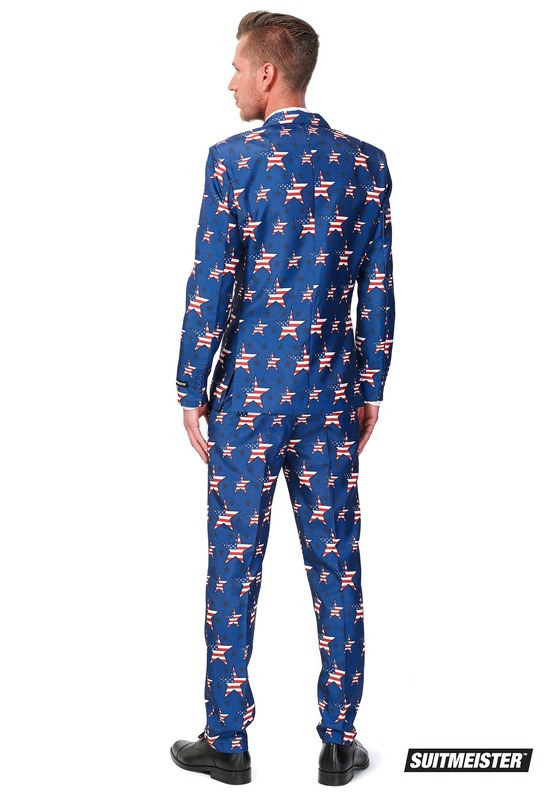 This suit is perfect for any U.S.A.-themed activity, from visiting Lincoln’s birthplace to touring the U.S. capitol building… or even just shopping for groceries. True patriotism never sleeps.